The quality of the game certainly seems to be at a level of one that would have been pitched around the various software houses at the time, and wasn’t a SEUCK game by any standards. Flik Flak was a good solid puzzler overall. 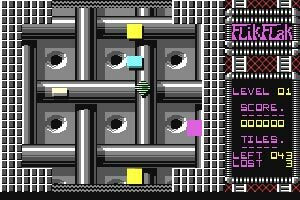 Flik Flak is an arcade puzzle game of 32 levels. One each level the player must deflect the tiles that come onto the screen, storing them on the sides of walls and preventing them falling through traps. This is done by positioning a diamond shaped bat in their path. To prevent the tiles from building up and blocking the play area, tiles can be deflected into like-coloured tiles and both will be destroyed. To complete a level a set number of tiles must be survived. If a tile is allowed to fall into a trap then it will be lost. For each tile lost the game becomes harder since the number of ‘active tiles’ increases- up to a maximum of seven. Also, if five tiles are lost, the game ends. This also happens if a stored tile prevents an ‘active’ tile from entering the screen- ie if an entrance is blocked. There are 32 levels, divided into eight groups of four. There is a password for each group and this can be entered on the title screen, allowing the game to be started on the first level of the group. Active Tiles: Active tiles are the rolling ones on-screen. Two active tiles will not collide, but simply pass over each other. If an active tile hits a wall or a stored tile of a different colour it becomes a stored tile. If two active tiles collide with a wall at the same time and place they are destroyed. 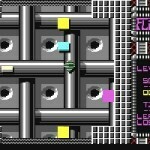 On later levels, difficulty is increased by introducing more active titles, faster tiles, tiles entering from up to four directions at once and more difficult wall and trap arrangements. Many thanks Ken! I’ve moved the instructions you kindly posted into the main piece (Under ‘articles’) and have added a credit to you.